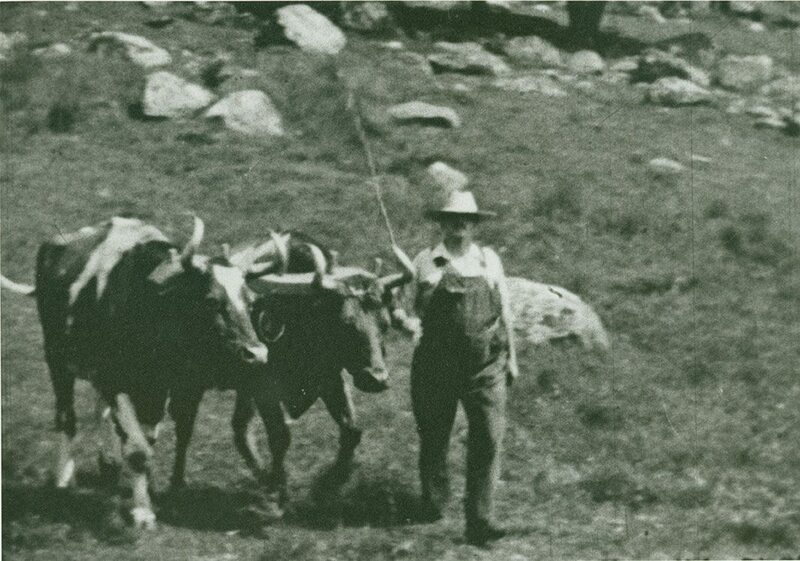 One of the main reasons Henry Ward Ranger was attracted to Old Lyme was it's proximity to the rural subjects of farms, fields, and farm animals. Sheep, oxen and horses were all painted, but the cow was the most popular. 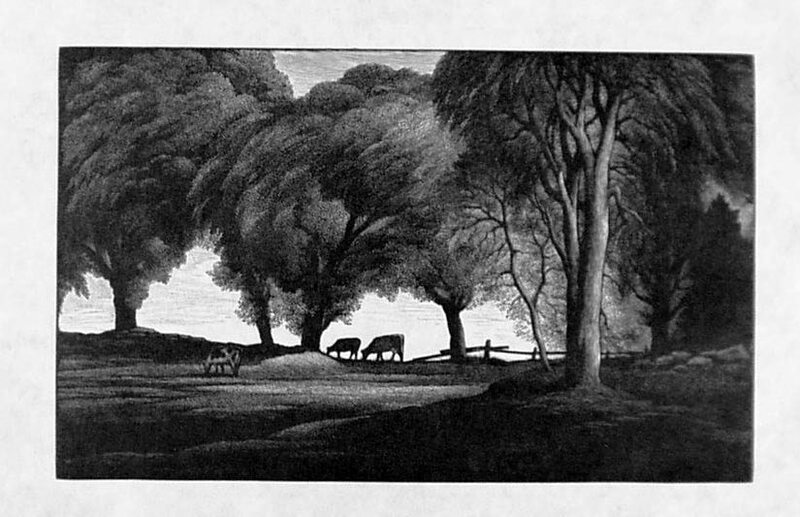 Whether lying in a straw-filled stable or lazily grazing in a grassy meadow, the many images of cows captured the rural lifestyle of Lyme and conjured up a simpler time when man was more tied to the land—a subject that was popular at the time when modernity was sometimes viewed as a threat. 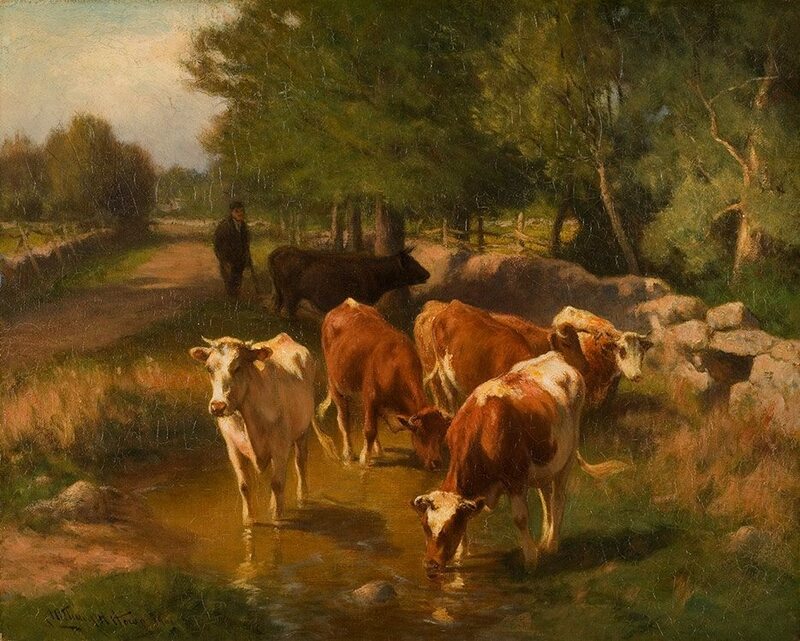 This “cow craze” made the market for cow paintings very profitable and the images most fashionable—even for turn-of-the-century parlors. 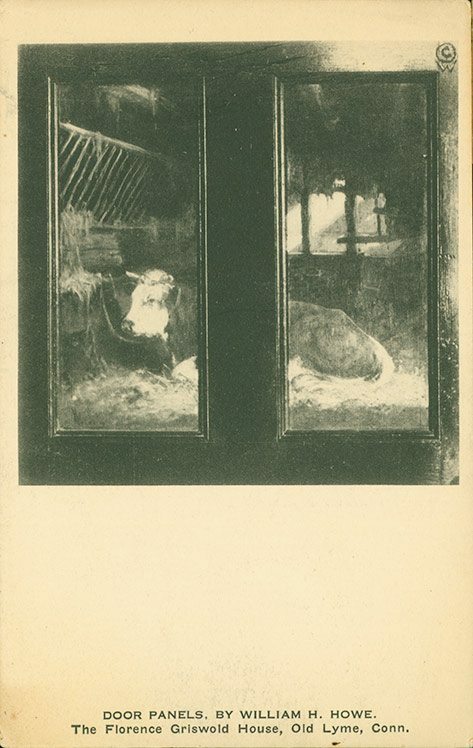 Indeed, the artist William Henry Howe painted an altered version of his award-winning Monarch of the Farm (1891) on a door in Miss Florence’s formal parlor and Matilda Browne painted a scene of grazing calves on Miss Florence’s bedroom door. 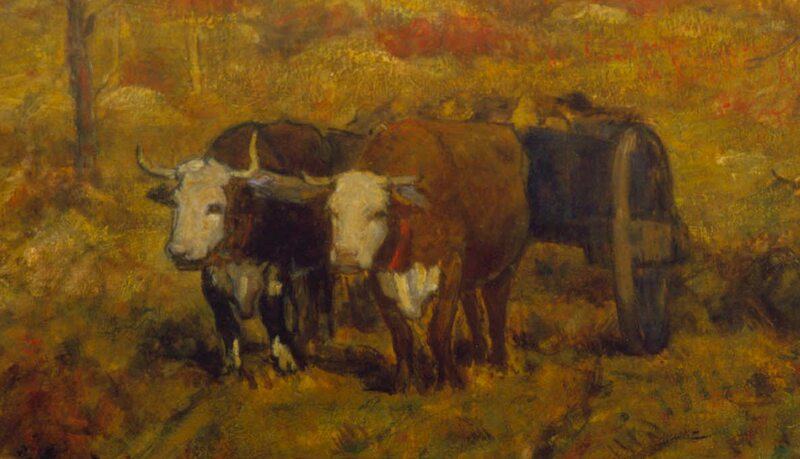 Over the years the Museum has collected many paintings of rural subjects and especially of cows. [SIC] Ef I ever do tackle it you can bet your last dollar that you’ll never find me wastin my time doin cattle pictures. 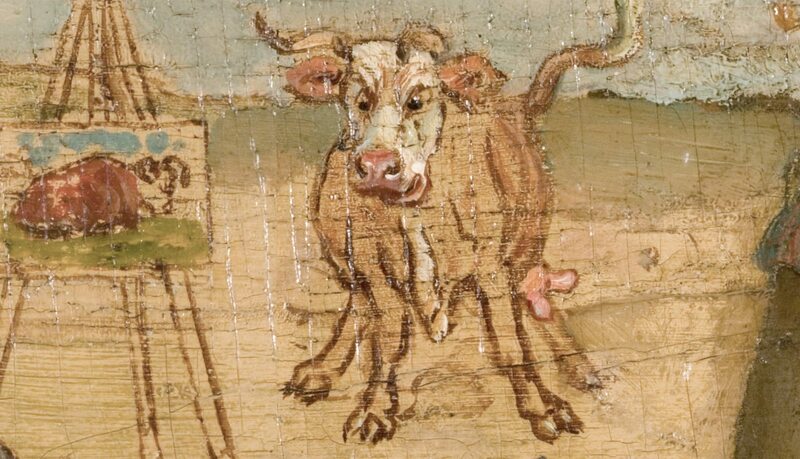 I can’t imagine ever wantin to put a full-length portrait of a cow right smack over the sofy in my parlor. In my jedgement the cow’s place is not in the home. Yet they tell me that there’s any number of people that won’t rest happy till they’ve put a large brindle cow in a genuine gold leaf frame, and stabled the critter in a Louis Quince drawin room. Uncle Howe, Tildy Browne and Carleton Wiggins who all go in strong for livestock, have equipped many a fash’nable home with a supply of Holstein and Jersey Cattle yet I heer the demand for that sort of good is jest as heavy as ever. Can you beat it? Mebbe in these days of soarin meat prices folks is stockin up, so that when beef has become only a lingerin mem’ry in the dinin room, they will hae a souv’nir of it in the parlor. Artists come early in the spring and stay late in the fall and fraternize with the farmers who raise sheep for their benefit, keep oxen for their good and cart home picturesque heaps of sedge and hay from the russet salt marshes that border the town on its southernside. 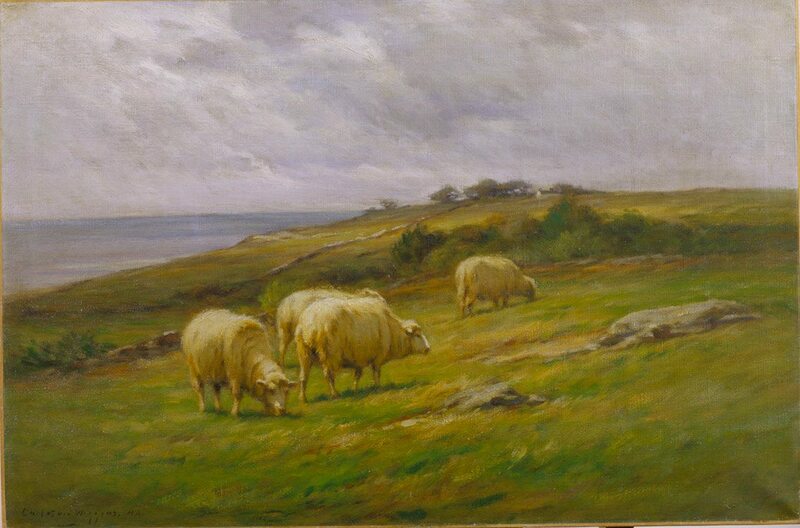 paintings of the New England farm were popular subjects that were well received by the viewing and purchasing public. From sheep grazing on windswept hills and farmers toiling in the fields to quiet empty fields guarded by and ancient stone wall, these Lyme images captured a nostalgic sense of the past. These intimate views of rural life, as well as the tender “animalscapes,” as they are sometimes called, painted in Lyme and Old Lyme, were created by some of the most prominent painters working in this genre. 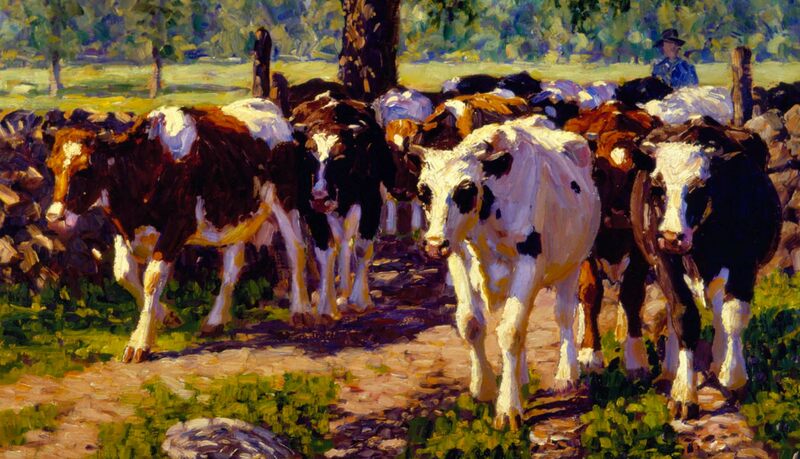 The men and women paint and the sheep and cattle exist for the sake of being painted and, upon the approach of a stranger, arrange themselves in picturesque groups, while the artist fixes his camp chair and white umbrella. The town has been known as an ideal place for artists for some time, and its wind-swept pastures, winding roads, and glimpses of the Sound have been the delight of artists these dozen years. 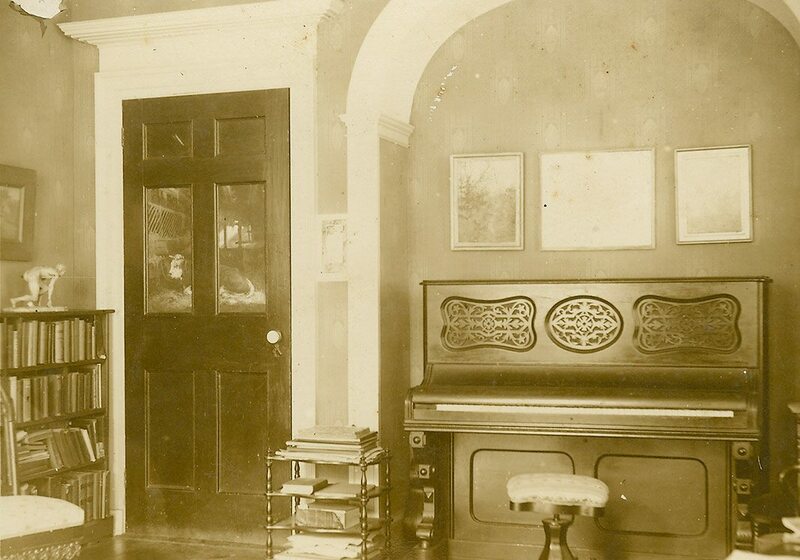 comes to us in the form of black and white photographs and historic postcards. The Museum’s archives are filled with fascinating photographs that reveal the people and places surrounding the Griswold boardinghouse. 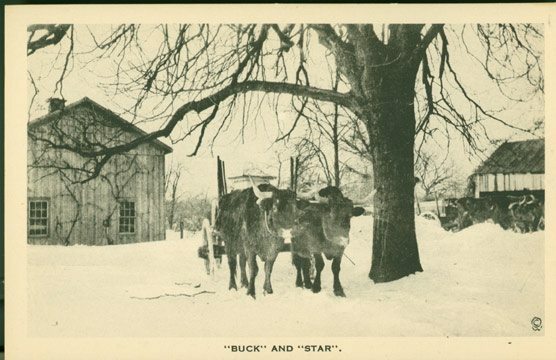 Because of the popularity of rural subjects, many postcard images contain images of the Lyme and Old Lyme farms and agrarian practices, such as salt-haying and hauling lumber.